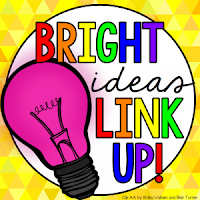 It's time for the June Bright Ideas linky. I love reading all the tips and hints bloggers share during the linky. Almost makes me wish I wasn't retired. Almost. I think I've got a great idea to share with you this month. Do any of you have trouble keeping track of your keys? Please tell me it's not just me. The school where I taught the most years during my teaching career had locks all over - the school's front door, the alarm system, the gate to the hallway, the classroom door, the cabinets. Fortunately, one key fit all of those. But it meant that I always had to know where my key was. And that was.....hard. I had a tendency to put my keys down during the day and not be able to find them again. I'd be patting the top of my desk, hoping to hear them under the litter of papers. Usually some bright kiddo would help me out - they're in the closet lock....but not always. And towards the end of the year? Yeah, I didn't know where anything was! I needed help. So I made it a classroom job. Every year when I explained the job, my third graders took the responsibility very seriously. If I picked up my keys, their eyes were glued on me. There's something about an eight-turning-nine year old that loves knowing something the teacher doesn't. And it was fine with me! I rarely got out more than, "Where are...." before my Keeper of the Keys told me where I'd left them this time. Maybe you need help with your keys or with something else that you have trouble keeping track of. Do what I did - make it a job! 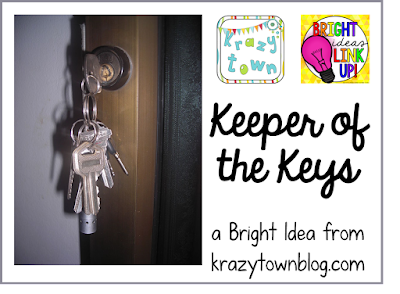 If you enjoyed this Bright Idea, please consider visiting my Teachers Pay Teachers store and joining me on Facebook, where I share more great ideas. I love this idea. You should make a Keeper of the Keys badge product for TPT! HAHAHA! This post cracked me up because I feel like you were describing ME! :P I ALWAYS lose my keys.The custodians pretty much know when they see me looking for them…it's because I couldn't find my keys or locked myself out! Awesome post. Thank you for sharing! Lol! Love this! I need a keeper of my cell phone. I'm constantly asking my kids where I set my phone down bc i use it for so many things in my classroom! I love this idea! I had so many assistants when I was teaching just for this reason. Kids will always remember because they are always watching you, noticing everything! What a great idea for another classroom job! I am definitely going to need this next year!! Thanks for sharing! !